In this Ashka Build Guide, we provide an overview of his strengths, abilities, Battlerites and matchups. Ashka is a powerful ranged Champion that’s capable of bombarding a single area with repeated fireballs. His use of Fire Storm, combined with Flame Strike, he can zone enemies with ease while causing massive damage. Although he’s thematically opposite to Alysia, he’s arguably stronger than her. With greater control through a petrify, a powerful knockback in Molten Fist and projectile barrier thanks to Firewall, he can be oppressive in the right hands. A masked creature specialized in dark sorcery and pyro-kinetic powers. Casting devastating fire spells on his opponents, staying away from close combat. Don’t be fooled by his size, Ashka’s inner demon strikes fear into all who face him. He’s undoubtedly stronger in 2’s than 3’s, just because this grants him the space to maximize his AOE potential. That said, even in 2’s and in the hands of a skilled player, he can be difficult to pin down. Effective use of his Molten Fist and Searing Flight are often more than enough to evade even the toughest melee opponent, while Searing Flame (which allows him to heal himself) grants some much needed sustain. If Ashka has any downsides, it’s simply that miss-management of anyone one of his outs can see him killed incredibly quickly. Fireball (LMB) - Ashka’s basic attack allows him to deal 15 damage per projectile. While it’s not rapid, it does allow him to steadily poke opposition while changing position. What’s important about Fireball is the fact it resets Ashka’s Ignite. Maintaining this damage over time effect is key to his output, and ensures he can repeatedly pressure high value targets. Fire Storm (RMB) - His strongest ability but one that leaves him vulnerable without specific Battlerites, Fire Storm bombards an area with multiple projectiles. Each projectile causes his Ignite DOT, allowing him to then follow up with Fireball. Not only that, but most Champions caught by the initial projectile are then trapped in the knock-back cycle, ensuring they receive the full damage. Unless you choose to take the Battlerite which allows you to move while using Fire Storm (honestly, it’s fairly mandatory) you need to be extra careful where you position yourself. Not only that, but be prepared to cancel-cast the attack as it can easily trigger counters. Searing Flight (Space) - Key to Ashka’s survival, Searing Flight allows him to instantly fly to a long distance location. On arrival, he’ll deal 10 damage to all those around him in a small radius. Whether escaping or diving, use of Searing Flight at the right time is paramount to Ashka’s survival. Dive too early with it and you’ll be left vulnerable, and be easily killed. Use it too quickly to escape and enemies will quickly chase you down. If you can, only use it to engage if you can guarantee a kill or burst rotation on an opponent, while it’s often best to use Molten Fist first to bait melee Champions. Flame Strike (Q) - Integral for stealing the central Orb, Flamestrike is a high damage AOE attack that stuns all enemies caught in its radius. If an enemy is in its center prior to the explosion, they’ll be forced to use an escape ability or suffer the damage and crowd control. If you can, try to use it to steal the Orb (this takes a little practice), or when the enemy doesn’t have line of sight of you. Often you can tag multiple opponents at once, especially if they aren’t anticipating its cast. Molten Fist (E) - Your primary means of shutting down melee Champions, Molten Fist offers a powerful knockback against a single target that you hit. The snare component also ensures you can kite afterwards for a brief period. The main thing to remember about Molten Fist is that while its primary value is to knock opponents back, it’s also great for avoiding damage. If you’re expecting an AOE attack to hit you (such as Pestilus’ panic) you can scoot out the way quickly using Molten Fist. Firewall (R) - Integral to Ashka’s kit, Firewall allows him to deny all projectiles cast at him when the wall is active. Against Champions such as Jade, or Destiny, it works incredibly well at mitigating most of their strongest attacks. Despite being a defensive ability, Firewall can also be used fairly aggressively and cast immediately on an enemy to cause your Ignite damage over time effect. If you then follow in with basics, you’re capable of dealing significant damage. Searing Fire (Shift + Space) - Providing Ashka with amazing amounts of sustain, at a cost of 50% of his Energy, Searing Fire allows him to trade with most Champions. While he’ll still take high damage versus the likes of Rook or Shifu, he can poke from afar while topping his health up. If he’s diving, Searing Fire still allows him to deal damage on impact, while ensuring further damage he delivers keeps his health high. If you can’t reach your Support, or aren’t near any health orbs, ensuring you don’t lose a major chunk of your health is where Searing Flame comes in. Molten Chains (Shift + Q) - Acting as a point-blank version of Flame Strike, Molten Chains immediately erupts around Ashka. Anyone caught in its radius is affected by Petrify, buying Ashka enough time to walk away. Save Molten Chains for melee Champions, or to lock-down a Support Champion by using Searing Flight > Molten Chains onto them. Infernal Scorch (F) - Ashka’s Ultimate works similarly to Thorn’s, in the sense that Ashka flies forwards leaving a large telegraph behind him. Anyone caught in the initial impact suffers burst damage, the Ignite effect, and subsequent damage over time. It’s also important to know that Infernal Scorch allows Ashka to travel through scenery and all opposing Champions. An aggressive Battlerite, Blaze allows Searing Flight to empower Ashka's next Fireball, causing it to deal increased damage and instantly inflict his Ignite effect. For finishing off an enemy, or pressuring a single target when diving, it allows Ashka to deal considerable damage. Allowing Ashka to slow enemies who are suffering from his Ignite effect, Magma also boosts it initial damage. 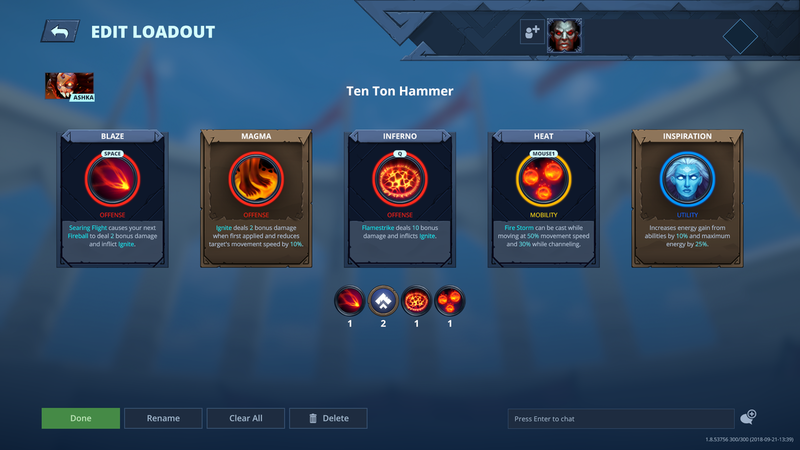 Whether you're using Fire Wall, or Fire Storm to inflict Ignite, it'll ramp up your damage considerably. Significantly improving the impact damage of Flamestrike, Inferno also causes it to now deal damage over time. Inferno is also fantastic for snagging the central Orb that little bit easier, while pressuring any group caught in it (don't forget, the Ignite it now causes also slows). Heat grants Ashka the ability to move while casting Fire Storm. Considering he can't without it, it allows him to reposition while bombarding an area, ensuring he can always maintain a line of sight. Ashka relies a great deal on his Ultimate, so gaining 10% extra Energy from abilities, and a 25% increased Energy total, all thanks to Inspiration, ensures he gains it quickly. Not only that, but it also ensures he has access to his defensive EX abilities most of the time. Variable: Combustion further increases the damage of Fire Storm, allowing it to deal AOE impact damage against those caught in its blast. Those struck suffer Ignite, and 8 damage. In 3 versus 3, a well timed Combustion can deal massive damage to an entire team. These Hero Threat Levels (1 being lowest threat and 10 being highest threat) are to help you determine which enemy Heroes can give you a headache. For the Heroes listed here, take extra care as they're particularly dangerous for Ashka. Ezmo: His speed, rapid attacks, ability to shield himself and his long ranged poke allows him to wear you down very fast. 1. You should constantly be using your basic attack as Ashka, not only to keep up your DOT effect when it's active, but also to repeatedly poke when your other abilities are on cooldown. 2. When you've applied Ignite to an enemy, try to always ensure it remains active. Don't go out of your way to if there's significant risk to your health, but the added damage does allow you to trade fairly well with most opponents. 3. Cancel Fire Storm if you are likely to trigger a counter, or miss your opponent. Don't waste the cooldown just to see fireballs fly. 4. Fire Storm can trap enemies into its rotation, as the minor knockback and large projectiles ensures players can struggle to avoid it. Try to hit high value targets. 5. Only ever use Searing Flight to engage if you can gaurentee your escape afterwards. Not having Searing Flight available versus a melee composition can see Ashka killed near instantly. 6. Remember that Flame Strike has a brief delay before it detonates. Take this into account when snagging players or stealing the central Orb. 7. Never use Flame Strike to defend yourself when a melee opponent is next to you. Use Molten Chains instead: it's an instant PBAOE petrify. 8. Molten Fist can knock any target away a considerable distance. Once you've done so, make use of the slow component and walk further away. This will create a huge amount of space between you and any enemy. 9. Carefully rotate Searing Flight and Molten Fist. Using both instantly will leave you with no means of escape. 10. You can use Firewall aggressively by plonking it immediately on an enemy player. They'll suffer damage over time, and will still be unable to fire at you. 11. Use Firewall to protect the Orb from ranged attacks while you and your team steal it. It's amazing against Champions such as Jade. 12. Searing Fire is expensive. Only use it when going 1 on 1 with ranged opponents, or to top your health up if you're not near a Support. 13. Molten Chains is instant. When you're being harrassed by melee, use it, and walk away. Save Searing Flight for when they re-engage you. 14. Always try to snag as many enemies as possible with Infernal Scorch, and be sure to use Fireball against those caught to keep your Ignite DOT active.